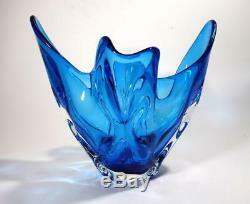 STRIKING VINTAGE ITALIAN MURANO BLUE ART GLASS BOWL / VASE. Presenting a stunning vintage large Murano art glass bowl/vase in a beautiful deep blue colour form. This bowl features a beautiful colour of deep ocean blue. The bowl features eight clear glass lobes in total to the outside lower portion of the piece creating superb tonality. These lobes have been worked into a pinched design which continues to travel up to create an arm like effect. The entire bowl has been encased within a thick clear glass layer which truly highlights the design and creates fantastic visual optics. The glass has a beautiful clarity and form and also features a beautifully ground and polished base. It is most definately a striking design!! This beautiful Murano piece measures 26cm across at its longest, 17cm at its widest and stands 23cm at its tallest point. Presented in excellent vintage condition with no chips, cracks or repairs. The polished base carries typical age related wear mrks which are mentioned for accuracy only. The glass maintains a beautiful clarity and shine. This piece weighs 1.9kg unpacked. Auctiva offers Free Image Hosting and Editing. The item "STRIKING VINTAGE ITALIAN MURANO BLUE ART GLASS BOWL / VASE" is in sale since Tuesday, November 27, 2018. This item is in the category "Pottery, Glass\Glass\Art Glass\Italian". The seller is "coffeechain" and is located in Newcastle. This item can be shipped worldwide.